International hotel developer Starwood Hotels and Resorts has announced the opening of the Maldives’ first resort under its luxury brand world St. Regis next year. Starwood Hotels currently operates the W Retreat & Spa and Sheraton Full Moon Resort & Spa. The new Vommuli Resort will feature 77 luxurious private villas, a spa with six private treatment rooms, an infinity swimming pool, and a state of the art fitness centre along with a dive and activity center. “This signing further fuels Starwood’s strong growth momentum in South Asia, where we continue to see strong demand for high-end hotel accommodations,” said Sudeep Jain – Starwood’s Vice President of Acquisitions and Development. The St. Regis brand operates more than 30 hotels and resorts around the world. “We are pleased to partner with Starwood to bring this hotel to life: marrying the bespoke service of the St. Regis brand with the ‘barefoot luxury’ mentality of the Maldives,” said Ravi Appasamy Managing Director of Residency Resorts Male Private Limited. Tourism Minister Ahmed Adeeb has pledged to lease a third island in Thaa Atoll for resort development. Only one resort is operating in the south-central atoll at present. Speaking at a ceremony to inaugurate a futsal field in Thimarafushi last night, Adeeb said the government plans to lease Kanimeedhoo for tourism. The island is located next to Thimarafushi, where the atoll airport is located. The government in May leased Thaa Atoll Kalhufahalafushi for tourism development to a Chinese company. Some 8,945 people live in Thaa Atoll. President Abdulla Yameen had pledged to bring ten resorts into operation every year. According to the central bank, three resorts were opened in 2014, which increased the total registered number of resorts to 112 in the Maldives. The Maldives Monetary Authority (MMA) said the Maldives earned US$2.6billion in tourism revenue in 2014. Tourism minister Ahmed Adeeb has said he expects an increase in Chinese investment in Maldives tourism following the lease of a second island for resort development to Chinese companies. The joint venture -between China’s Guandong Beta Ocean and a Maldivian company – were awarded Vaavu Atoll Kunaavashi this week to develop a five-star luxury resort with some 142 rooms. “More Chinese investors will follow. There is a lot of interest, from Sri Lankan and Singapore companies as well,” Adeeb told Minivan News today. The tourism ministry in May also signed an MOU with the state-owned China Machinery Engineering Corporation (CMEC) to develop Thaa Atoll Kalhufahalafushi as a resort. Chinese tourists accounted for nearly one third of arrivals in 2014 with a total of 363,626 arrivals. China now represents the single biggest source market for tourists in the Maldives with a 30 percent market share. On Monday, Adeeb said China’s Ambassador to the Maldives, Wang Fukang, had pledged to increase Chinese arrivals to one million. The venture would require extensive infrastructure developments, such as airport developments and building new resorts to increase the total bed capacity of the country, he said. Mega Maldives pioneered direct flights from Maldives to China in 2009. It operates four to five flights a week from Beijing, Shanghai, and Hong Kong. “We have long argued that the demands from the Chinese tourists to the Maldives are at times a little different from the European traveller. Therefore, getting investors who understand the mentality of these tourists is a very good thing,” he added. 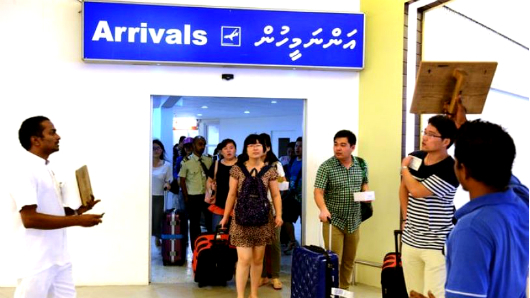 Mauroof Zaki, the secretary general of the Tourism Employees Association of the Maldives (TEAM), noted the importance of equipping Maldivian staff with the skills to cater to an influx of Chinese tourists. “We need more language classes on Mandarin or training on food and beverage services to Chinese tourists,” he said. However, he said he was concerned that Chinese tourists may not be as conscientious as European tourists on labor rights, human rights and the environment. “When ethical tourists come to the Maldives, it improves the work environment for Maldivian staff, for example, tourists pushed for the equitable distribution of service charge to staff,” he said. The Maldives Association of Tourism Industries (MATI) was not available for comment at the time of going to press. The Maldives reached the one million tourist arrival mark in 2013. In 2014, the Maldives welcomed 1.2million arrivals, and the government hopes to see 1.4million arrivals in 2014. The tourism ministry last week launched the “Visit Maldives Year 2016” campaign. The US$10million will see festivals and trade events, and award free holidays throughout the year. The Maldives has also been designated as the partner host country for the ITB fair in Berlin in 2016. According to Forbes, Chinese investment in the global hospitality industry has seen a surge in the last two years. The trend started when Chinese Dalian Wanda group announced plans of investing a US$ 1.09 billion luxury hotel in London. Since then, Chinese companies has announced a US$ 900 million skyscraper in Chicago, a US$ 1.95 billion acquisition of New York’s Waldorf Astoria, and a US$ 399 million hotel in Sydney. Maldives has become a main attraction for Chinese travelers, with South China Morning Post saying, the country has topped travel lists for Chinese travelers, with the country being promoted in China’s media as an “approved destination” by the Communist Party government. President Abdulla Yameen has launched the Visit Maldives Year 2016 campaign in a bid to increase tourist arrivals to the Maldives to 1.5million in 2016. The campaign, organized by the Maldives Marketing and Public Relations Corporation (MMPRC), will run until the end of June 2016. The government plans to hold an underwater festival, an international surfing event, a tree-planting programme and photography exhibitions in the Maldives and global locations as part of the campaign. The Maldives will also host the renowned tourism fair, ITB Berlin, in March 2016, as part of the Vist Maldives Year campaign. “I am confident that through this global campaign we can look forward to welcoming record numbers of holidaymakers to our beautiful shores in the Maldives,” President Yameen said. The president launched the campaign’s logo and website at an ongoing UN World Tourism Organization (UNWTO) conference at the Bandos Island Resort yesterday. He highlighted the importance of tourism in job creation, raising standards of living and growth of the construction, agriculture and handicrafts industries. The government has earmarked three locations for community based tourism development, the president said. The guesthouse island project aims to involve small and medium businesses in the lucrative tourism industry without encroaching on inhabited islands. The project, launched in June 2014, envisioned the development of a 21,00 bed resort in Laamu Atoll Thumburi. The MMPRC changed the project to Baresdhoo in the same atoll last month. He also pledged to provide sovereign guarantees for resort development loans with an interest rate less than four percent. The policy is aimed at kick starting stalled development on some 60 islands leased for tourism, the government has previously said. The government has also cut import duty on construction materials for the resort development. Speaking to the press yesterday, tourism minister Ahmed Adeeb said tourism growth is expected to slow this year due to a decline in Russian arrivals. However, he said the Maldives is on track to achieve the goal of 1.4million arrivals this year. The Maldives marked the arrival of one million tourists in 2013. In March, travel and tourism publication TTG Asia reported that Maldivian resorts were offering up to a 30 percent discount in prices to attract more arrivals. Tour operators have also complained over ad-hoc increases in tourism sector taxes, including a hike in TGST from eight to 12 percent in November 2014 and a new green tax of US$6 per tourist in November 2014. Airport service tax was also raised from US$18 to US$25 in July 2014 for visitors leaving the country. 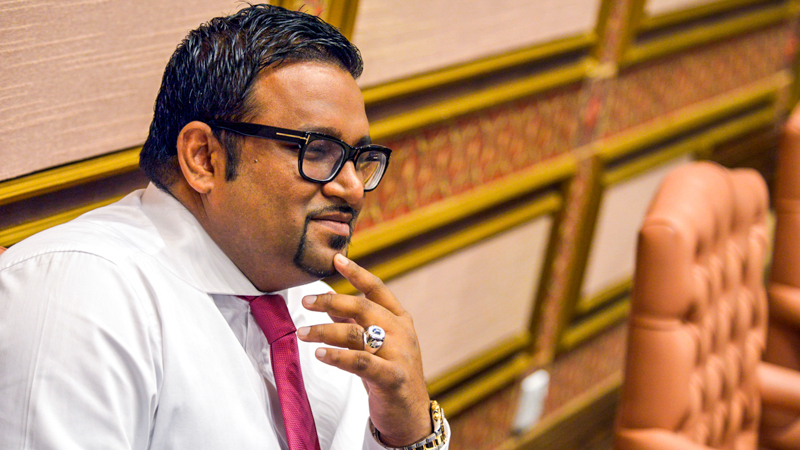 Adeeb said there was room for more growth in the tourism sector, and said the parliament’s decision to increase resort lease periods to 99 years as an important step. 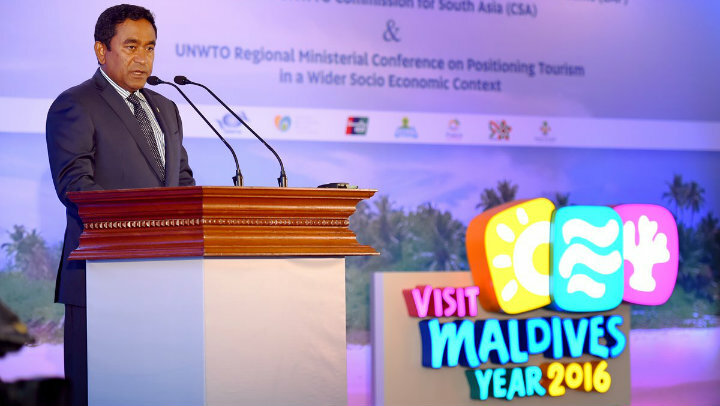 The UNWTO secretary general, Taleb Rifai, noted the growth in Chinese arrivals to the Maldives and spoke of the need to cater to Eastern tourists and older tourists. The tourism ministry last month leased Thaa Atoll Kalhufahalafushi to China Machinery Engineering Corporation (CMEC) to develop a Chinese-friendly resort in the Maldives. The Indian minister for tourism Dr Mahesh Sharma, meanwhile, pledged to increase arrivals from India to the Maldives. The ruling Progressive Party of the Maldives (PPM) manifesto pledges to establish 50 resorts in the Maldives in its five-year term and award resort shares to Maldivians working in the tourism sector. Adeeb has previously said the government will introduce a model for resort workers to obtain shares in resorts by the end of the year. The government has also pledged to develop uninhabited island, Ismehelaareha in southern Addu atoll, as a resort to improve the southern economy. Ruling coalition MP and tourism tycoon Ahmed Siyam has announced plans to build a 600-room resort on the island of Dhigurah in northern Noonu Atoll. “On completion, the resort will be the largest tourism offering in the Maldives, creating more than 2,500 jobs for the local Maldivian community,” the MP’s company, Sun Siyam, said. The resort on Dhigurah will have 14 different room categories, 15 food and beverage outlets as well as an underwater restaurant. Siyam is also to open a second resort in Sri Lanka’s Kalpitiya. “The Maldives has a form of home-grown service culture and industry know-how that is currently not being fully utilised to its full potential domestically, and certainly not on the international stage. Just like the well-known Swiss, Indian and Thai forms of hospitality, Maldivian hospitality can create desire and demand in any region,” he said. Siyam also sits on the board of the Maldives Association of Tourism Industry. The government is seeking legal changes to allow the extension of resort leases to 99 years for a lump sum of US $5m, and to expand the powers of the tourism ministry. The lease extension scheme, which would represent the first time they have been lengthened beyond 50 years, aims to raise money for the government. The bill submitted by government-aligned MP Mohamed Ismail would also transfer to the tourism ministry the power to authorise developments at resorts and conduct environmental assessments. The changes aim to incentivise investors, make it easier to obtain financing from international institutions, and increase revenue for the government, the proposed law states. To be eligible for a lease extension, a resort property must be operational with an existing lease period of 50 years and must not owe money to the government. If the amendments pass, resorts will have to seek authorisation from the tourism ministry for any development on a resort that could “permanently alter” the island, plot of land, or lagoon’s environment. The ministry must compile an environmental impact assessment before issuing permission. “Making the services available under one roof would ease the burden on investors, speed up services, and improve investor confidence,” the introduction to the legislation says. Under existing laws, the Environment Protection Agency conducts assessments and authorises projects such as land reclamation. The agency functions under the environment ministry. However, the new amendments state that “only the tourism ministry will have the authority” to conduct assessments and authorise developments. The tourism ministry will also have the power to impose fines not exceeding US$5 million for violations. The introduction says that the involvement of other ministries and institutions in resorts hinders the tourism ministry and “lowers investor confidence”. Under the current Tourism Act, the maximum lease period for resorts or hotels is 50 years. However, the constitution allows leases up to 99 years. Former Economic Development Minister Mahmoud Razee told Minivan News today that from “a commercial investment point of view it’s a good move,” but questioned the government’s “sincerity”. “Because when they were in opposition they made a big hoohaa about it,” he said, with reference to current ruling party MPs protesting against the then-Maldivian Democratic Party (MDP) government’s plans to extend resort leases from 25 to 50 years. The move shows the government is trying to make up revenue shortfalls, said Razee, who was part of the MDP government. He said the current administration was “not curtailing expenses” but increasing the number of political appointees. The measures include revisions of import duty rates, the introduction of a “green tax”, acquisition fees from investments in special economic zones, and leasing 10 islands for resort development. Razee also suggested that the administration might allow resorts to pay the extension fee in instalments if the tourism industry lobbies the government. When the MDP government offered extension of leases for 50 years in exchange for an upfront fee, Razee said resort owners were “not so eager” and “relatively few” paid the fees. In January 2014, Maldives Association of Tourism Industry secretary general Ahmed Nazeer questioned the practicality of collecting resort lease extensions in a lump sum. Nazeer told a parliamentary committee reviewing revenue raising measures that only 17 out of the more than 100 resorts had paid lease extension fees upfront. Razee meanwhile criticised the government’s “flip-flopping” on economic policy, referring to its reversal of a decision to impose higher import duties on garments and motorcycles. He noted that customs authorities are promising to reimburse importers who are paying the higher tariffs that came into force on April 1, even before amendments reversing the hikes have been passed. “There’s no clear-cut, defined, long-term policy,” Razee said. A petition calling for sweeping changes to resort employees’ working conditions and a minimum wage has collected two thousand signatures during its first five days. The Tourism Employees’ Association of Maldives, which launched the petition, said it had amassed signatures from workers on 17 resorts since last Wednesday. The petition demands a minimum monthly wage of US $600 across the sector through an amendment to the Employment Act. There is currently no minimum wage and the petition says that wage rates have not increased in the sector for 10 years. The workers are also asking for quotas to require 80 per cent of tourism employees in the country to be Maldivian, which would require big changes in the hiring practices of resorts. Current laws require 50 per cent of resort employees to be Maldivians, but the rule is not widely enforced. The sector employs some 11,426 Maldivians and 16,342 expatriate workers, meaning that overseas employees constitute 59 per cent, according to preliminary figures for the 2014 census. TEAM also wants the president to honour a pledge to make shares in resorts available to their rank-and-file employees, a rarity in a country where resorts are generally owned by private companies controlled by a few individuals. In February 2014 President Abdulla Yameen said that by the end of the year, a number of resorts would be floating a portion of their shares to the public, and urged Maldivian employees to become stakeholders. The president said that share ownership would be a “lucrative addition to their current income from salary and other perks through employment at these resorts”, according to a press release issued at the time. Speaking at the opening of the Sun Siyam Iru Fushi resort, Yameen also said the Sun Travel resort group would float up to 40 percent of its shares to employees in the coming years. However, the pledge of shares for resort employees has not so far become a reality. The petition also asks for a 12 per cent service charge to be applied and for 99 per cent of that to be distributed “fairly” among tourism employees, as set out in the Employment Act. TEAM’s supporters are seeking the right to form a union, as set out in the constitution, and the right to protest in resorts, which was banned in 2012 under the Freedom of Assembly Act. The law says that protests can only be held in resorts and in air and sea ports after a special permit from the police based on the advice of the military, but TEAM cites the constitution’s guarantee of the right to peaceful protest. Workers who had been fired from Sheraton’s Maldives luxury resort for demanding union recognition protested near the Sheraton Maldives Full Moon Resort and Spa in February, according to the website of the International Union Federation. According to Haveeru, Ahmed Adeeb, the tourism minister, said at the time that protests in resorts would affect tourists both directly and indirectly. “Such things must not be encouraged by anyone. Especially when it is something banned by law, it must not happen. No one should encourage or give room for such things,” Adeeb said. Officials from the Tourism Ministry were unavailable for comment at the time of press. On Thursday, about 50 employees from the international airport in Seenu atoll Gan protested over a new salary structure which they said would result in lower pay than before. They stopped protesting when management agreed to return to the previous wage structure. Dozens of tourists are stranded each year in the Maldives by scams involving liveaboards, harming the country’s reputation among visitors, boat owners say. Scammers use fraudulent websites to collect payments on liveaboards without the owner’s knowledge, leaving tourists stranded at the airport. Others sell holidays on luxury cruisers, but when tourists arrive in the Maldives, transfer them to low-grade boats. Boat owners are speaking out about the problem for the first time, saying they decided to do so out of frustration over a lack of action against the fraudsters. Some 81 liveaboards — boats on which tourists stay for several nights, also known as safari boats — operate in the Maldives, offering surfing and diving trips, some with luxury accommodation. A safari boat owner, who asked not to be named, said an Indian dive tour operator alerted him on March 19 to a Maldivian company selling a holiday on his boat without his knowledge. He told Minivan News the government has failed to take action on scammers. “This is very destructive and tarnishes the Maldives’ image,” he said, calling on the ministry to suspend licenses and blacklist fraudulent tour operators. Amir Mansoor, the owner of the luxury liveaboard Carpe Diem, also said that liveaboard scams are frequent. “This is very concerning, even if it’s two or fifty tourists a year, and affects the Maldives’ image,” he said. Deputy tourism minister Hussain Lirar, however, denied any knowledge of fraud, but said the government would take action through law enforcement agencies against scammers. The anonymous liveaboard owner said that at least 88 Russian and German tourists were stranded in November 2013 after a scam, and said he had rescued some tourists from the group. The Liveaboard Association of Maldives (LAM) this week said it had received complaints from foreign tour operators, mostly in India and Hong Kong, involving fake bookings and operators collecting payments without offering a service. “The scams involve fraudulent websites claiming to be authorized travel agents offering cheap liveaboards,” the organization said, following the March 19 alert from the Indian tour operator. LAM subsequently advised holidaymakers and tour operators to be wary of rock bottom prices in the Maldives and to book through agents listed on its website or reputable travel companies listed by the Maldives Association of Travel Agents and Tour Operators. There are currently 1,367 beds available on safari boats in the Maldives, often costing hundreds of dollars a night. A Hong Kong-based tour operator, which says it sends 2000 guests to the Maldives every year, said a tour operator called Poseidon Tours in 2012 stranded several guests “desperately in Malé without any excuse,” according to leaked emails. “It was the not the first case to our company and on and off we heard that other agents/guests were having similar experiences. I don’t think that this is a good reputation to your country,” the operator said. The operator reimbursed its clients, but Minivan News was unable to confirm whether the government had taken action against Poseidon Tours. A total of MVR9.8 billion (US$635.5 million) has been pledged to the Maldives by 24 foreign investments registered so far, President Abdulla Yameen said in his presidential address today. In the address delivered at the opening of the People’s Majlis’ first session of 2015, Yameen said the 24 foreign investments registered under his administration were not tourism-related. “Under these investments, a total of MVR9.8 billion has been proposed to be invested in the Maldives during the next five years,” Yameen said over loud protests from opposition MPs calling for the release of former President Mohamed Nasheed. The pledged foreign investments represent a 70 percent increase on the previous year, Yameen added. President Yameen’s second presidential address was delivered amidst an ongoing political crisis sparked by the arrests and prosecution of former Defence Minister Colonel (Retired) Mohamed Nazim and former President Mohamed Nasheed on charges of terrorism. The newly formed Maldivian Democratic Party-Jumhooree Party (MDP-JP) alliance held a massive protest march in the capital last Friday (February 27) demanding the pair’s immediate release. During last year’s budget debate, opposition MPs expressed skepticism of the government’s forecast of US$100 million expected as acquisition fees for Special Economic Zones (SEZ) by August 2015. The opposition has also criticised the lack of significant foreign investments despite assurances by President Yameen’s administration with the passage of the SEZ Act last year. Yameen began the address by assuring MPs that the current government would protect and uphold the constitution, adding that significant efforts were made during 2014 to “strengthen the civil justice justice and criminal justice system of the Maldives”. Legislation on civil trial procedures would be submitted to parliament this year, Yameen said. A ‘risk management framework’ to combat drug smuggling and abuse would also implemented during 2015, he continued, and privately operated rehabilitation centres would be opened with modern facilities. While a bill on establishing an Islamic University has been submitted to parliament, Yameen said eight new government-funded mosques would be built during the year in addition to 10 new mosques funded by Saudi Arabia. “Seven island harbours were constructed last year. And work is underway on constructing harbours on 32 islands. Additionally, land reclamation has been completed on four islands. And while land reclamation is ongoing in three islands, coastal protection work is ongoing in three islands,” he said. Moreover, road construction projects have been contracted for 10 islands, Yameen said. A project awarded to the Malé Water and Sewerage Company (MWSC) to resolve flooding in the capital was nearly complete, he continued, whilst US$100 million worth of foreign loans have been secured to provide safe drinking water and establish sewerage systems in inhabited islands. Construction of 1,089 flats in Hulhumalé have now been completed, Yameen said, and work on a further 5,000 flats would begin this year. Reclamation of 227 hectares of land in Hulhumalé would also be completed in March, he said. A waste management project targeting four northern atolls is meanwhile expected to be completed during the year, Yameen added. While a fishermen’s marina was established in Felivaru last year, Yameen said three more marinas would be set up in Kooddoo, Hulhumalé, and Addu City Feydhoo. On the education sector, Yameen said a diploma certificate has been set as the minimum qualification for teachers and a new salary structure has been put in place. The government’s health insurance scheme ‘Aasandha’ has been expanded to cover chronic illnesses and kidney transplants, he continued, whilst a programme was launched in November to provide “super-specialist” doctor’s service to the atolls. Legislation is currently before parliament to protect women’s rights in divorce cases, Yameen said, which would provide temporary shelter to divorced women and establish rules for equitable division of property. Moreover, the government is formulating rules to provide easy access to healthcare and prioritise employment for persons with special needs, he said. Loans worth MVR200 million (US$12.9 million) would be issued in the near future under the ‘Get Set’ programme for youth entrepreneurs, he continued, and a bill on youth rights would be submitted to parliament this year. Work was underway on building 36 sports pitches in islands with populations exceeding 2,000 people, he noted. Yameen noted that the forecast for economic growth in 2015 was 10.5 percent, up from 8.5 percent last year, adding that in 2014 inflation was kept on average at 2.4 percent and the budget deficit brought down to MVR1.6 billion (US$103.7 million). In a bid to encourage lending, Yameen said the minimum reserve requirement for banks would be reduced this year from 20 percent at present. The forecast for the current account deficit in 2015 is US$214.7 million or 6 percent of GDP, he added, down from US$290 million or 10% of GDP last year. “As a result of the increase in foreign currency the Maldives earned in 2014, serious difficulties faced by the public in obtaining dollars have been resolved, and with God’s will, the dollar shortage has been alleviated,” he said. Referring to a decline in tourist arrivals from Russia and China in December and January, Yameen said the government has launched efforts to increase arrivals from both source markets. “Despite the Maldives being seen as a high-end tourist destination, efforts are now underway to advertise the Maldives as an affordable luxury destination, expand the Maldivian guesthouse business, and expand the tourism industry to target mid-market [tourists] as well,” he added. Yameen also said the government was taking back uninhabited islands leased for resort development due to contractual violations. In the wake of former coalition partner JP’s alliance with the opposition MDP, the government seized several properties leased to JP Leader Gasim Ibrahim’s Villa Group for alleged agreement violations. Last week, the Maldives Inland Revenue Authority (MIRA) gave a 30-day notice to Villa Group to pay US$100 million allegedly owed as unpaid rent and fines. In 2015, Yameen said 22 islands would be leased for resort development both under normal bidding processes and as joint ventures. Yameen added that development in the SEZs would create new jobs and spur economic growth as the minimum threshold for investments was US$150 million. The government was in the process of formulating a master plan for the ‘iHavan’ project, Yameen said, which was among the mega projects envisioned in the SEZs. A basic design for a new terminal at the Ibrahim Nasir International Airport (INIA) has been completed, he continued, and the government was seeking interested parties to repair and resurface the airport’s runway. Yameen said the Maldives achieved significant successes during 2014. The “Maldives’ name shined in the outside world” last year, he said. The Maldives assumed the chairs of both the Association of Small Island States (AOSIS) and World Health Organisation’s (WHO) executive board, Yameen noted. Relationships with regional neighbours and Arab-Islamic nations were “brought back to its previous heights,” he continued. In addition to state visits to friendly nations, Yameen said various agreements that would prove beneficial to the Maldives have been signed with India, Sri Lanka, China, and Japan. Yameen also appealed for the participation of all Maldivian citizens in celebrating the country’s 50th independence day in July. “God willing, this year will see new progress made in fulfilling the government’s pledges to the people,” he said.